Ever since I traded in a steady paycheck for an artist's existence, I've become a big fan of restaurant specials/discounts. What? A free appetizer, you say? 30% off the entire bill? Why, yes. I'd be delighted! Thanks! And another basket of bread, please. 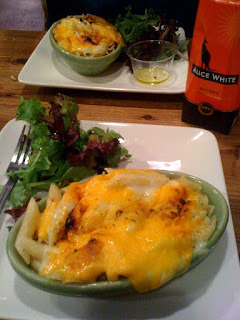 When I heard Stories Bookstore and Café in Echo Park was offering a $5 Mac and Cheese special on Monday nights, I hightailed it down there as fast as I could. Stories Bookstore is a delightful little independent bookstore right up the street from the hoppin’ concert venue, The Echo on Sunset. Selling both new and used books, the store hosts frequent evening events including author readings, live music performances, and in case you're dying to know what the future holds, Tarot Card readings. It's a great place to find quirky and creative gifts or hang with cool folks who like to read. In the back of the store is a tiny café selling sandwiches, salads, treats, and yep, you guessed it, macaroni and cheese. I should also mention there's a nice back patio where, during the day, writers and laptop surfers soak up the sunshine and free wifi. I said, “I’ll be honest. It tastes like vinegar." He was a good sport and we had a laugh about it. Soon our mac and cheese arrived and boy, did it look promising. You can see in the photo, it was served with a big pile of melted Cheddar and Mozzarella cheese on top, crisped in just the right places. I appreciated the choice of ziti noodles instead of the old macaroni noodle stand by. But after sinking in a fork, I discovered what I was really eating was the macaroni and cheese version of a grilled cheese sandwich. The noodles, cooked to perfection, had been buttered, seasoned and tossed in the bottom of the baking dish. Then, a big pile of cheese was melted on top creating that tasty cheese blanket. Sadly, no actual cheese was mixed in with the noodles, nor was there nary a drop of cheese sauce in the mix to create that gooey, creamy texture we’ve come to expect from our mac. Now here’s the thing, it wasn’t bad. I enjoyed the perfectly cooked ziti noodles bathed in butter, salt and pepper and covered in cheese but it just wasn’t what I’d call macaroni and cheese. I bet, however, there are more than a few poor students or bachelors who would consider this perfectly suitable if not higher quality mac. And hey, you can’t beat the price. It came with a little pile of mixed greens dressed in a simple lemon juice and olive oil dressing and I found the portion just big enough to feel sated. We did splurge and try one of the “Anger Management” cookies, peppermint chocolate chip flavor, and not only did it take care of our dessert craving, it also freshened the breath. Now you might be thinking $5 isn’t really that cheap for mac and cheese. We’ve definitely reviewed less expensive side orders at large restaurants. But Stories is a cool independent book seller, a dying breed near extinction, and I’m happy to fork over a few Drachma to do what I can to keep them in business. If you get a chance, swing by, grab a cup of Joe and maybe pick up an Oscar Wilde doll for the kids. I promise, it’ll make a good story. Are you aware that not ALL mac and cheese is based upon sauce Béchamel? Traditional mac and cheese in the deep south uses eggs and milk to create a "curd like" consistency and not a smooth cheese sauce texture. Thanks for your comment and your visit. Yes! I've had the southern style mac and cheese too and it is yummy though I do prefer a cheesier sauce, I won't lie. 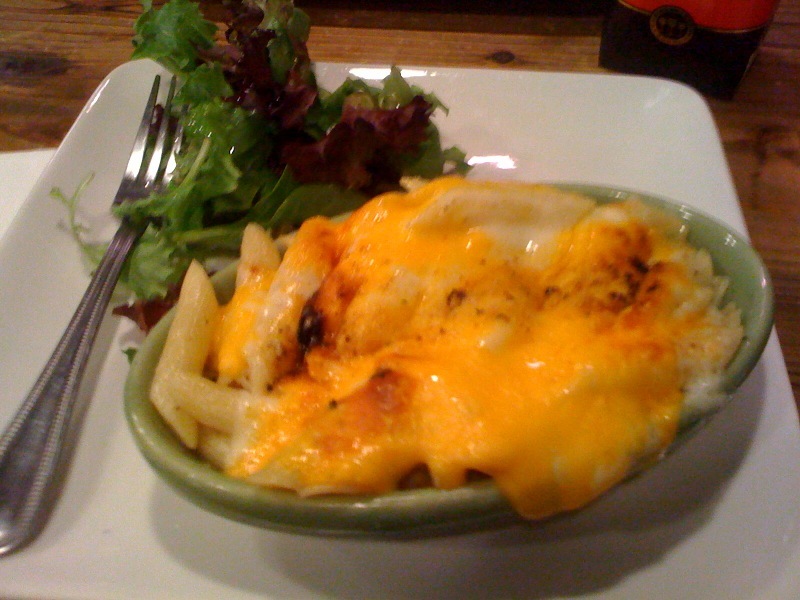 In this example, at Stories, cheese was melted on top but not added in with the noodles. It was a first for me but I still found it pleasant because I love noodles and cheese.